Left: Photo of the original Stab Vest test knife as used in the 1993 Knife Resistance testing of Police Body Armour. This is a Six Inch Bowie Type made from high grade Sheffield Steel. Police confiscated knives and improvised stabbing weapons are used as a basis for body armour stab vest test procedures. Knives that pose the most serious threat to body armour systems are termed “engineered”. This in Plain English means a blade type that when “fully impacted” into a wooden block, would retain its shape and pointed effectiveness to be capable of being used again in its original, relatively undamaged state. If you were to examine most kitchen knives, you might determine that such “drawer knives” do not really qualify for inclusion. Fully impacting a bread knife into a wooden surface would probably snap the blade. In fact, most household knifes will bend if presented with any degree of force. The instant a Knife starts to bend is the physical energy point where the pointed knife weapon looses its penetration potential. In contrast to the above, knives purchased from specialist shops are quite different - they are made of high grade steel and drop into the “engineered” category. They are capable of retaining their shape at maximum human impact energy. Such blade types are what body armour systems must resist to qualify for certification. The newest test blade in the UK 2007 Police standard is just such a blade - with a pin sharp tip, and virtually “no give” in its construction. The Spike Test is considerably more severe than the knife test. Materials capable of preventing knives penetrating will often completely fail to stop pointed weapons of relatively small diameter. The Anti-Stab protection level protects from most stab threats from larger cross-sectional blades. The test blades for this system are shown above right, and represent typical high quality engineered knives that might be used by an assailant. The 1993 standard was the first knife standard introduced in the UK. The Anti-Stab system protects from knife attack, slashes, broken bottles and the trauma from physical assault. Protection systems made in the Anti-Stab standard are considerably less expensive than our newer systems listed below and offer excellent protection from bladed weapons. For most general security duties the Anti-Stab level provides excellent protection. It will resist the type of weapons shown above - The L113 & L104 (PSDB 1993) Test Blades. Contrary to popular belief - the bigger the knife, the easier it is for body armour to resist its penetration. This is the reason our newest protection materials concentrate on smaller cross-sectional weapons. We make our anti stab vest body armour from the same material as our bomb blast blankets. In January 2006 we re-tested the vest to reveal a very impressive V50 result of 400m/s, which is a steel fragment strike at a supersonic velocity. Personnel who remove land mines are generally supplied with 460m/s systems. We also ran some low threat ballistic trials against this anti-stab body armour. We reported a .38 Special at 200m/s and a .45 Colt at 180m/s. A 2007 Police Standard to protect from pointed weapons and knives. KR signifies "Knife resistance" and SP indicates "Spike Resistance". The picture below (left) shows both test weapons. The spike can be compared to "Ice Pick" or any weapon ground to a point. The material we use to produce our SP systems are also impermeable to attack from hypodermic syringes. The system offers superb protection to all edged, pointed and sharp weapon attacks. The armour system is constructed of multi-layered flexible fabric and contains no solid plates. It can be combined with our HG1/A, HG1 and HG2 ballistic armours to offer dual purpose protection. Spike resistant armours have become necessary due to evolutionary threats from assailants armed with improvised pointed weapons and syringes. Syringes are becoming an increasing menace. Many enquiries we receive are more concerned with syringes than a threat from a knife. The threat of AIDS and Hepatitis are well documented, less well known is that an air bubble injected into the bloodstream from an empty syringe can result in near instant fatality. Shown left are the 2007 Police Test Weapons. The Spike is easily capable of penetrating most current issue police stab armour in levels KR1, KR2 & KR3 at the 24 Joule strike level. The Blade shown left is a modified sharper version of the 1999 blade. It is worth noting that a 2007 spec KR1 is quite superior to a 1999 KR1. 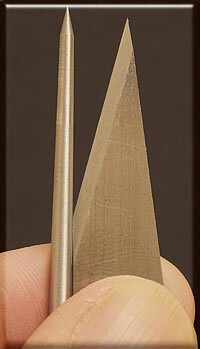 Below is the P1/B Engineered Blade tip shown against a fingertip. Right - typipical hypodermic syringe - easily stopped by our SP rated systems. Using the same material system as the KR1+SP1 with an increased resistance of 33 Joules against a P1/B blade and a spike. This level of protection is better suited to our overt styles of armour because of increased thickness and reduced flexibility. The level is suited to occupational risks which are greater than occasional. Confrontations on a regular basis in high crime areas might warrant this specification - example Police "Stop and Search" duties in districts with a known weapons carrying culture. For a general purpose stab / syringe vest, KR1+SP1 is generally preferable. The KR3+SP3 specification is usually purchased with the intention of occasional use in a potentially life threatening situation. Risk assessments recommending this protection level are relatively rare. Our sales of this level are less than all our other protection levels combined. Manufacturing KR3+SP3 systems from specialty fabrics usually results in good ballistic properties - for this reason we decided to make our KR3+SP3 fully ballistic (bullet resistant) to HG2/KR3+SP3 for economic reasons. How much is a Joule of impact energy in a “real world” example that can be easily understood. You can choose any everyday object and drop it from a given height to calculate the Joules of impact energy. In this example we will compare a real test sabot (shown left) and a 2 litre bottle of water. Both have similar weights and diameters. On the left is the stab test assembly used to strike a sample of body armour. The entire article is placed inside the equivalent of a “plastic drainpipe”, and allowed to drop (gravity free-fall) onto the body armour test sample. Spike testing is conducted in the same sabot (plastic assembly). The metal portion is exchanged for a metal spike holding arrangement. Right: Something to compare with. 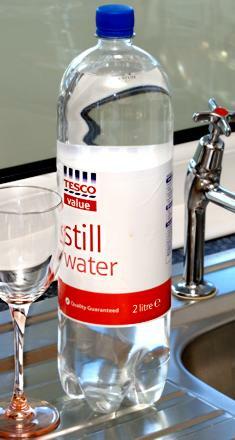 This 2 litre bottle of drinking water (minus 1 wine glass full - 146 mls to be precise) is exactly the same weight and diameter as the test sabot. This comparison gives a clear idea of the “punch power” of a sample “stab proof vest” sample test strike. Bottle Figure arrived at by adding the 46 gram water bottle to its 1854 ml water contents. Using the 2 litre bottle of water on the right we can produce this dedicated table of drop heights. If the bottle was raised to 4 feet 3 inches from the floor (gap between floor and bottle) and then dropped, it would release 24 Joules of energy upon striking the floor. This table should help your appreciation of the “punch power” of the stab-vest test sabot at different impact energy levels. The weight of the Knife Test Sabot at 1.9 Kilograms with the P1/B test blade or spike fitted is sufficient to penetrate a human body and possibly cause fatality without being dropped from any height - the actual weight alone is sufficient to penetrate human skin and tissue. This answers the obvious question of “how many Joules of stabbing energy can cause a fatality” - less than one. Left: Image of the HOSDB P1/B Test Blade used to evaluate stab proof (resistant) body armour vests. This test blade can also be seen in the plastic Test Sabot (above left). The newspapers and media routinely refer to “stab proof vests” as a matter of course. The correct description is “stab resistant vests”, or simply a “stab vest”. The word “proof” implies “convincing demonstration of irresistible stab properties” which can not truthfully be applied to any knife resistant safety product. The very fact that different stab protection levels are available is clear indication that the word “proof” suggests resistant to a defined level.